Celebrate your romance comedy story with Band Baaja Baaraat style caricature on this anniversary. Be.. Celebrate your romance comedy story with Socha Na Tha, Nuts About You style caricature on this anniv.. Woo your wife in DDLJ-style! The Brave-Hearted Will Take Away the Bride, also known as DDLJ. Best Gi..
Make sure every morning is a Good Morning with coffee on your very own Caricatured mug. Make colleag.. Happy Birthday Batman. Another great present for a comic book fan, something that no one ever consid..
You were a really great person first. It's your love that unites us, keeps us strong, and reminds us..
Hugs! Hugs! Hugs! Because you're loved so much, Mom, lots of hugs are coming your way Caricature Mug..
God couldn't be everywhere so He invented mothers. It's your love that unites us, keeps us strong, a..
A perfect gift for your attractive, feisty Punjabi girlfriend, wife. Or even for your busy businessm.. Celebrate your romance comedy story with 2 States style caricature on this anniversary. Best gift fo..
You Are My Happily Ever After. I fall in Love with you over and over again each day. Celebrate your .. Product Description:This caricature art is for the biggest multitasker of the world - Mom! Let her k.. 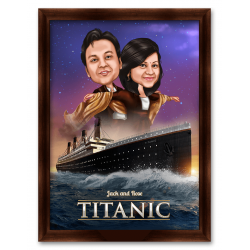 Your canvas artwork will be printed on a heavy (375 GSM) archival canvas using the best inks and pri..
Make your kids birthday celebration extra special with a truly unique gift that you can focus around..